Put all ingredients into the Philips All-In-One Cooker and mix it around. Add the liquid beef stock you can add a cup of water if you need to. Cook on SLOW COOK LOW TEMP for 9 hours. My partner would love your recipe,very delicious! Thanks. This is really a slow cook , great put on in the morning then be ready for dinner that night. giving this a go tomorrow! This sounds like a delicious change from the pumpkin and chicken soups I usually make thanks! I love slow cooker dishes, and my kids love vege soup, so we will definitely be giving this one a try! 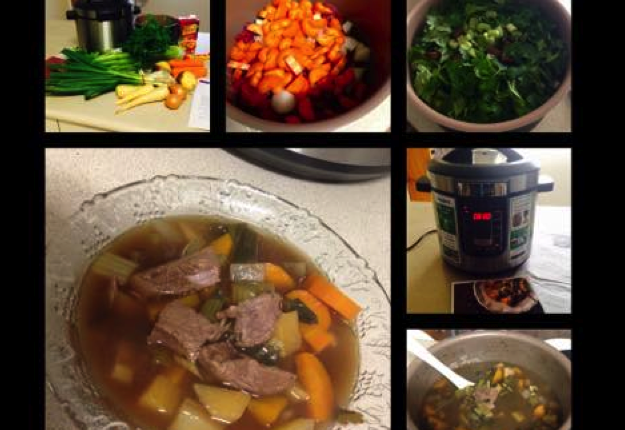 Thanks for sharing this recipe for a yummy looking beef soup. Potatoes sound good in this soup too! I tend to add whatever vegies are left in the fridge into my soups! i think that i would also add some potatoes- maybe some bacon lol but i love these ingredients in a lot of things.